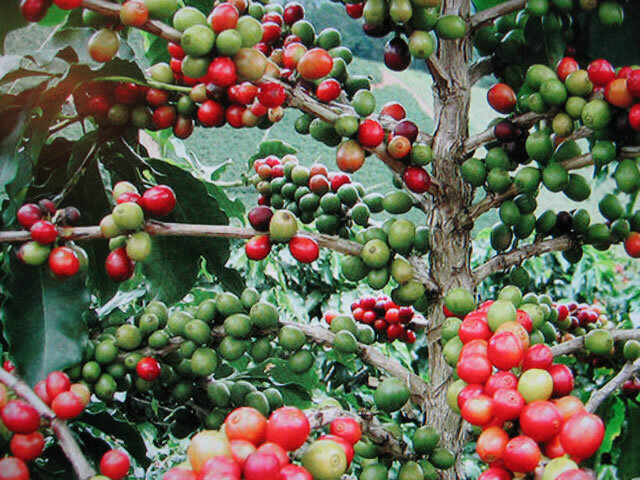 Distribution and habitat: Coffea arabica is originally found in the southwestern highlands of Ethiopia. It is now rare in its native state and many populations appear to be mixed native and planted trees. It is common there as an understorey shrub. It has also been recovered from the Boma Plateau in South Sudan. 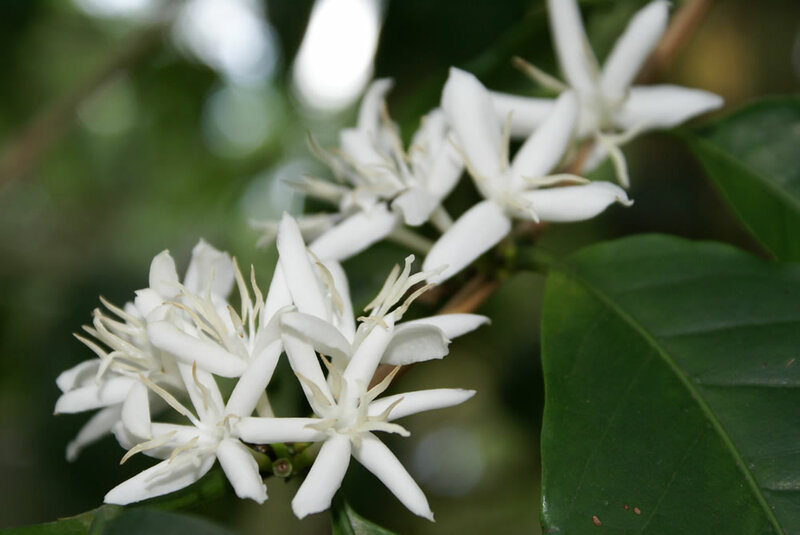 Coffea arabica is also found on Mount Marsabit in northern Kenya, but it is unclear whether this is a truly native or naturalised occurrence. Description: Coffea arabica is the only species of the genus Coffea grown as a house plant. 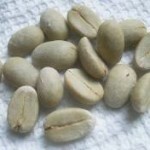 It is a shrub that is actually the major source of the coffee bean. This shrub, which is single-stemmed when young but gradually becomes bushy, can grow 4.5m (15 feet) high in open ground but seldom exceeds about 1m (3 feet) indoors. The glossy, dark green leaves, which are arranged on the stems in opposite pairs, are elliptic in shape with pointed tips and undulating edges and they grow up to 15cm (6 inch) long and 5cm (2 inch) wide. 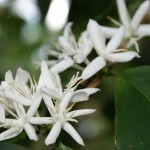 After a Coffea arabica is three or four years old, it can produce star-shaped, fragrant, white flowers about 1cm (0.4 inch) wide from the leaf axils. Flowering generally occurs in midsummer or early autumn and the blooms are followed by small fruits, which gradually change colour first from green to red and then to nearly black, a process that takes several months. 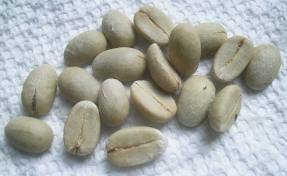 Within each fleshy fruit are held two seeds – two coffee beans. Houseplant care: Prune Coffea arabica back in spring to keep it bushy and full. It also gives it an attractive shape. Use clean pruning shears to cut the stem at a 45° angle, 1cm (0.4 inch) above a leaf axil (the place where a leaf attaches to the stem). 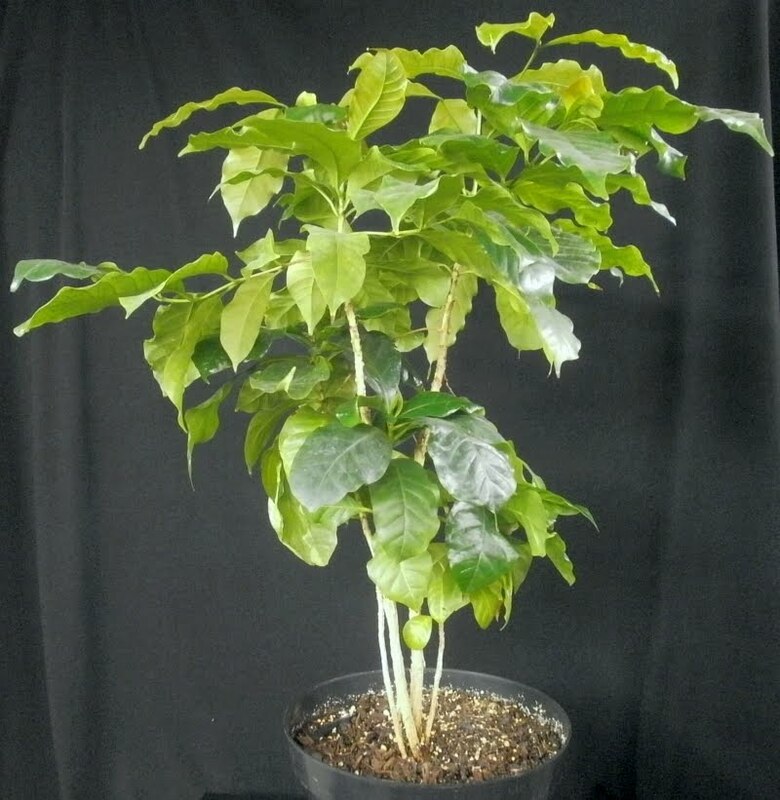 Growing Coffea arabica indoors is easy, being attractive plants. They are vigorous growers and are long-lived. Light: Grow Coffea arabica in medium light – for instance, close to a slightly shaded window. Temperature: Normally warm room temperatures as 16-24°C (61-75°F) are suitable for growing Coffea arabica. These plants cannot tolerate lower temperatures than 13°C (55°F). In warm rooms, particularly during the active growth period, stand the pots on trays of moist pebbles and mist-spray the foliage at least twice a week. Water: During the active growth period water plentifully as often as necessary to keep the potting mixture thoroughly moist , but never allow the pots to stand in water. During the winter rest period make the potting mixture barely moist, giving only enough water to keep the mixture from drying out completely. Feeding: Apply a liquid fertiliser about every two weeks from early spring to early autumn. Potting and repotting: Use a soil based potting mixture and put a layer of clay-pot fragments in the bottom of the pot to allow for more efficient drainage. Move the plants into pots one size larger every spring, just as new growth begins. Propagation: Cuttings are difficult to root. The best way to propagate is from fresh seed sown in spring. Seed freshness is essential. Plant two or three seeds about 2cm (0.4 inch) deep in an 8cm (3 inch) pot of moistened rooting mixture (equal parts of peat-moss and coarse sand), enclose the pot in a plastic bag or heated propagating case and stand it in medium light at a minimum of 24°C (75°F). No additional water is needed until after germination, which should occur in three to four weeks. When the seedlings are about 3cm (1 inch) high, remove the covering and pull up and discard all but the most promising-looking one. If necessary, gently firm the mixture around the base of the remaining seedling and grow it on in the same pot. Begin to water very moderately and to make regular applications of liquid fertiliser about once a month. When the young plant has reached a height of 8-10cm (3-4 inch), move it into an 8cm (3 inch) pot of soil-based potting mixture. Thereafter its cultivation needs are the same as those of mature plants. 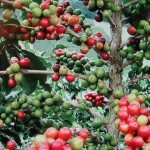 Coffea arabica will drop most of their lower leaves if the temperature drops below 13°C (55°F) for any length of time. The leaf tips will turn brown or black if the air is not sufficient humid. Scales insects sometimes attack Coffea arabica on the underside of the leaves. Treatment: Scale can be easily controlled by physical removal, wash off with high pressure jet of water or scrape off with cotton wool buds or by chemical control with appropriate pesticide. Coffea arabica ‘Nana’ is a dwarf forms of Coffea arabica. This variety may begin to bear flowers and fruits when it is only about 45-60cm (18-24 inch) tall.